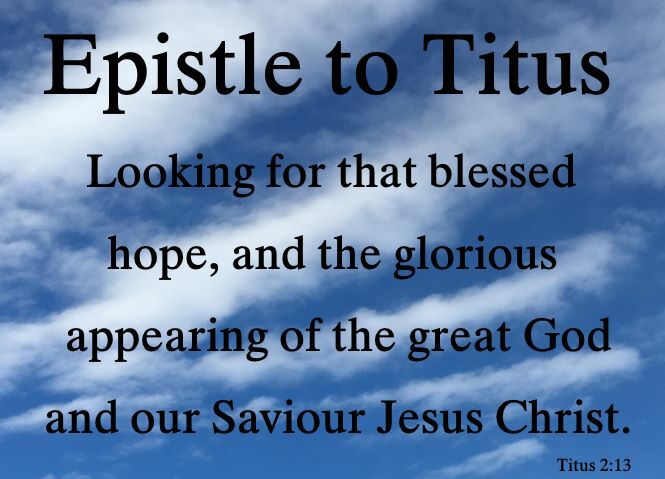 This description of the Epistle to Titus is from Easton's Bible Dictionary. Titus, Epistle to: was probably written about the same time as the first epistle to Timothy, with which it has many affinities. "Both letters were addressed to persons left by the writer to preside in their respective churches during his absence. Both letters are principally occupied in describing the qualifications to be sought for in those whom they should appoint to offices in the church; and the ingredients of this description are in both letters nearly the same. Timothy and Titus are likewise cautioned against the same prevailing corruptions, and in particular against the same misdirection of their cares and studies. This affinity obtains not only in the subject of the letters, which from the similarity of situation in the persons to whom they were addressed might be expected to be somewhat alike, but extends in a great variety of instances to the phrases and expressions. The writer accosts his two friends with the same salutation, and passes on to the business of his letter by the same transition (comp. 1 Timothy 1:2,3 with Titus 1:4,5; 1 Timothy 1:4 with Titus 1:13,14; 3:9; 1 Timothy 4:12 with Titus 2:7,15). ", Paley's Horae Paulinae. The date of its composition may be concluded from the circumstance that it was written after Paul's visit to Crete (Titus 1:5). That visit could not be the one referred to in Acts 27:7, when Paul was on his voyage to Rome as a prisoner, and where he continued a prisoner for two years. We may warrantably suppose that after his release Paul sailed from Rome into Asia and took Crete by the way, and that there he left Titus "to set in order the things that were wanting." Thence he went to Ephesus, where he left Timothy, and from Ephesus to Macedonia, where he wrote First Timothy, and thence to Nicopolis in Epirus, from which place he wrote to Titus, about A.D. 66 or 67.